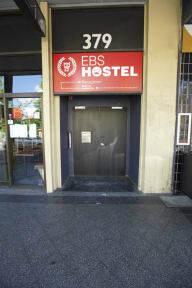 EBS Hostel Sydney i Sydney, Australien: Reservér nu! Our cheerful staff will be happy to assist you upon check in and provide you with any information that you may need. EBS Hostel Sydney has a range of eight, six and four bed dorm rooms and two bed private rooms available. The hostel includes a large common room area that is available for use by all of our guests. It features a large flat screen TV, Xbox, DVDs and board games. We DO NOT have 24-hour reception. Check Ins are available from 1pm-6pm. Late check-ins need to be booked and will be subject to a charge of $25 to cover staff costs. All guests are welcome to use our self-catering kitchen. Coin-operated laundry facilities are available for $3 per wash and $3 per dry. Hot shower facilities are also available for all guests to use. Security cameras operate 24 hours a day and there are two security doors.